How about easy to prepare cocktails that are sure to impress for your Halloween celebrations? Dennis Green, Director of Beverage at Pechanga Resort & Casino in Temecula, scares up a few creations for us. With more than 20 years of on-the-job experience leading some of the West Coast’s most notable hotel and casinos’ beverage programs, Dennis Green knows the main ingredient in any cocktail is customer satisfaction. Throughout his bartending tenure creating cocktail and libation menus, Dennis has developed scores of appealing specialty drinks – many ahead of trends like hand-crafted cocktails, and many just for Halloween. Candy corn martinis, Dragon blood punches, Zombie, a lime-green colored Witches’ Brew, and the list keeps on going. Green notes all of these spooky-themed sippers are very easy to make for your Halloween parties, or at friends’ homes. Dennis’ featured recipe for Halloween is the Jack-O-Lantern and here’s the recipe. Today’s Guest Host is Executive Chef Andrew Gruel of the growing Slapfish empire. Guest Host Chef Andrew Gruel and “SoCal Restaurant Show’s” Producer, Andy Harris, preview the show. The “SoCal Restaurant Show” recently was aboard Holland America Line’s ms Zaandam on the Vancouver, BC to San Diego sailing of a longer 22-day Inca Discovery Tour ending in Valparaiso, Chile. This morning we continue our exclusive behind-the-scenes look at the key people who oversee this 716 room floating luxury hotel with some 1,400 guests aboard. With us is HAL’s Master Chef Rudi Sodamin who also serves as Chairman of their celebrated Culinary Council. The Careers through Culinary Art Program’s (C-CAP) Sweet & Savory Spectacular benefit is Sunday afternoon, Oct. 19th at the Art Institute of California Los Angeles campus in Santa Monica. C-CAP Advisory Board member Eric Boardman previews the event. Eric is an accomplished Food Television personality and producer. The classic Venice Whaler (dating from 1944) located across from the beach in Venice has a new look and attitude. Specialty handcrafted cocktails are on the menu as well as “upscale dive-bar” cuisine created by Executive Chef Nick Liberato. The creative forces behind the KTOWN Night Market are at it again. Their inaugural Halloween Food Fest comes to Koreatown for two days on October 25th and 26th. The Seoul Sausage Co. partners (winners of Food Network’s “Great Food Truck Race” Season 3) are “curating” the selection of diverse food outlets. The creative forces behind the KTOWN Night Market are at it again. Their inaugural Halloween Food Fest comes to Koreatown for two days on October 25th and 26th. Saturday is 2:00 p.m. to Midnight and Sunday is Noon to 9:00 p.m. The Seoul Sausage Co. partners (winners of Food Network’s “Great Food Truck Race” Season 3) are “curating” the wide selection of food outlets. Look for the Lobsta Truck along with Seoul Sausage Co. It’s an international selection of flavors. Halloween may be just around the corner but it’s all treats this week on the show. Have you ever wondered what goes on behind-the-scenes on your favorite food TV show ? One of the best in the business, JoAnn Cianciulli, will be with us. She’s currently Co-Executive Producer of ABC’s “Recipe Rehab” and her long list of impressive food TV credits includes Fox’s “Master Chef,” Food Network’s “Next Iron Chef,” and Bravo’s “Top Chef.” She is also a best-selling cookbook author with two new tomes in the works! Brock Radke, Food & Web Editor of Las Vegas Weekly, will be along with his insiders’ Las Vegas dining update. He’ll talk about what Chef Gordon Ramsay is up to on The Strip and spotlight all the new happenings in the revived Downtown. Food tourism is a new trend in travel and one of the most popular and respected food tour enterprises is located right here in Los Angeles. 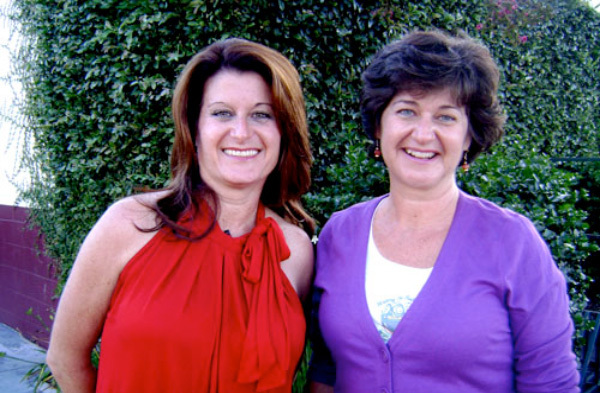 The dynamic Scalia Sisters (Lisa & Diane) are the force behind behind Melting Pot Food Tours. It all started with their popular Original Farmers Market Tour (Third & Fairfax) in 2008. Their “East L.A. Latin Flavors” walking tour (via the Gold Line) really gives you the sights and flavorful tastes of that relatively unknown community. On Saturday’s show they will announce their newest food tour and it’s a grabber! Talking about incredible flavors Jet will speak about his recent dining adventure at a dive BBQ joint in an unexpected Orange County location.